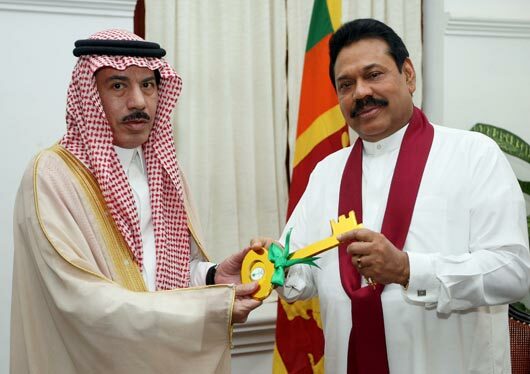 Abdul Azeez Al-Jamaz, Saudi Envoy for Sri Lanka and Maldives handed over the symbolic key to President Mahinda Rajapaksa for the 500 tsunami houses which the Kingdom of Saudi Arabia built in the eastern province in Sri Lanka. The Saudi government handed over the ownership of those houses through its Ambassador in Colombo at Temple Trees today on 09 June. Governments of Saudi and Sri Lanka signed a MOU in 2006 to build 1000 houses for 2004 tsunami victims in the east. These 500 units are a part of the houses pledged by Saudi government for tsunami hit people. Foreign Affair Minister Prof G.L Peiris, Deputy Minister Neomal Perera,Secretary to the President Lalith Weeratunga, Secretary to the Foreign Ministry, K.Amunugama, Government Agent of.Ampara, Sunil Kannangara, Mr.Amer M Aimlek and Mr.Al-Salamah Khaled of Saudi Arabia were also present at the occasion. well done,president.oba thumata siyalu dewiyange ashirwadaya prarthana karanawa. mewa balana inna baruwa thamai jvp animals la dangalanne. In return for this generous deed, the Sri Lankan Police Force harassed a Saudi Arabian Police Officer who was holidaying in Colombo with his wife and sister-in-law, at the Majestic Checkpoint, when the visitor was returning to the Coinamon Hotel after dining at Mt lavinia Hotel, in a three wheeler. It is alleged the Policemen snatched US $’s from the visitor’s wallet prior to release. Please appoint a one man commission to investigate this incident. Also, now that all Tsunami problems are under control, can we request the Saudi Government to provide semi-permanenet accomodation in Tamil Nadu to house the SL tamil population who are to be mass expatriated to TN as proposed by my fellow blogger, Guru Sathyadasa. The mass expatriation of SL Tamils to TN is the most viable solution to all parties including the Congress Govt in Delhi and Jayalalitha Govt in TN. Strike while the iron is hot and push the mass expatriation solution through before the next General Election in Delhi where the Hindu fanatics in BJP are likely to gain power. The fanatics are likely to assist out tamil bretheren in pursuing the separatist Eelam solution. Nicholas Dias, do you have anything to contribute? yathura dunna,e unata me gewal,ahinsaka minisunta deida,nethnam thamange hithawath ayata witharak deida?